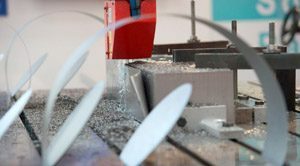 The EMO Hannover – World of Metalworking trade show was held in Hannover, Germany from September 18-23, 2017. With over 2200 exhibitors form 44 countries, and 130,000 attendees – 50% from overseas – EMO Hannover was responsible for generating over 8 billion Euros worth of business deals. The show took place under a promising economic environment. The IMF had recently confirmed a 3.5 percent growth in global GDP. According to additional forecasts by British-based Oxford Economics, a partner of the German Machine Tool Manufacturers’ Association (VDW), the machine tool industry is expected to grow by 3.4 to 5.6 percent this year. With these positive economic winds, EMO Hannover showcased an array of innovations in all areas of technology that will become a strong driver of investment. Attendees saw numerous high-caliber offerings from international exhibitors along with a rich and varied conference program covering myriad aspects of production markets, technologies, connectivity and safety. 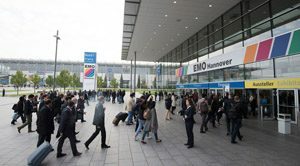 The next EMO Hannover is scheduled for September 16-21, 2019. CES 2018: What did industrial companies and other businesses miss at the “consumer electronics” event? Doug has over 30 years tracking and reporting on new products and services introduced by industrial companies from around the world. Compact design, flexible installation options and versatile interfaces make the scanCONTROL 2600/2900 laser-scanners the ideal choice for high-precision profile and dimensional measurements in production environments. For measurements on red-hot glowing metals, transparent and organic materials, Micro-Epsilon offers a Blue-Laser series. Nipron’s UZP-600, a Japanese-made PCB type switching power supply, achieved low noise and high efficiency which realizes reduced heat generation based on its improved circuit design. Despite its small size, UZP-600 has large output capacity of 600W continuous and 1200W peak. In addition, it has high lightning surge resistance and compliance with medical standard. An instantaneous power failure backup functionality is also available with an optional unit. Beckhoff sets new benchmarks with the XPlanar: free-floating planar movers move jerk-free and without contact over planar tiles arranged in an arbitrary layout. Travelling magnetic fields provide for exact and highly dynamic positioning. The result: maximum freedom in product transport, maximum flexibility and optimum machine design. Experience the new XPlanar at Hannover Messe in April! An all-rounder imager for numerous industrial applications: From metal processing to plastics, in fire prevention tasks as well as in the automotive sector. The spot finder function allows accurate temperature measurements of moving objects. Turck is supporting the move towards Profinet integration in process automation with the world's first IP67 I/O module with Profinet S2 system redundancy. The IO-Link master is the only device of its kind at present, that is able to establish communication relations to two controllers via a single connection. The F950 Series Inline Filter features barbs for 1/16” or 1/8” I.D. tubing. The F960 Series Filter has 10-32 UNF male threads with a barb for 1/16” or 1/8” I.D. tubing, and the F970 Series Filter is available with 10-32 UNF female threads or M5 female threads. Get the latest WIR reports straight to your inbox. Find us on the social web. © 2019 Thomas Publishing Company. All rights reserved.